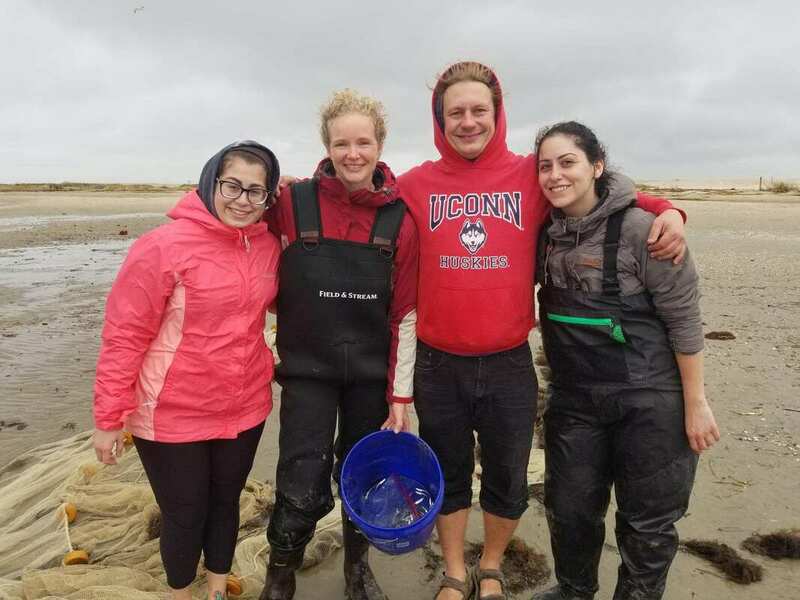 Nicolas has been awarded a grant from the Atkinson Center Sustainable Biodiversity Fund in support of his work using genomic tools to inform the conservation and management of Atlantic cod. Congratulations, Nicolas! 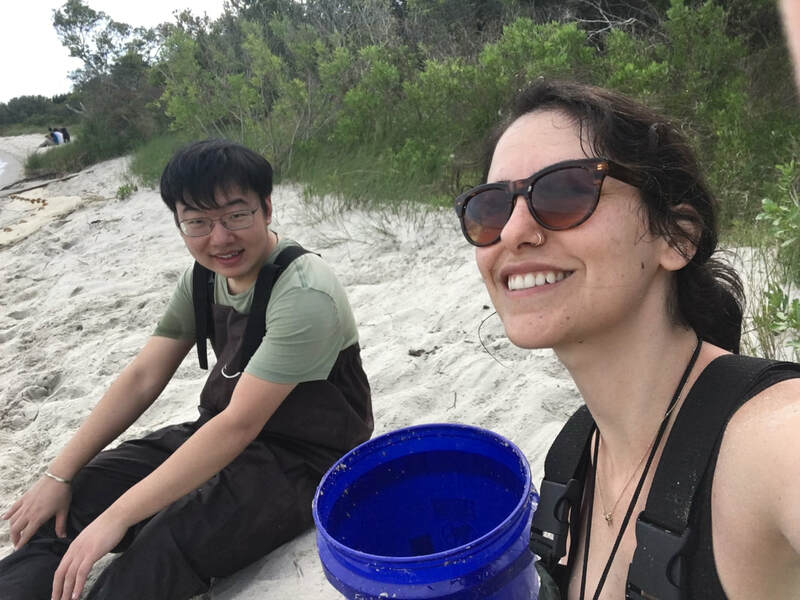 Maria presented new findings at the Annual Ecology and Evolutionary Biology December Symposium, and Nicolas presented at the Department of Natural Resources GSA Symposium in January. 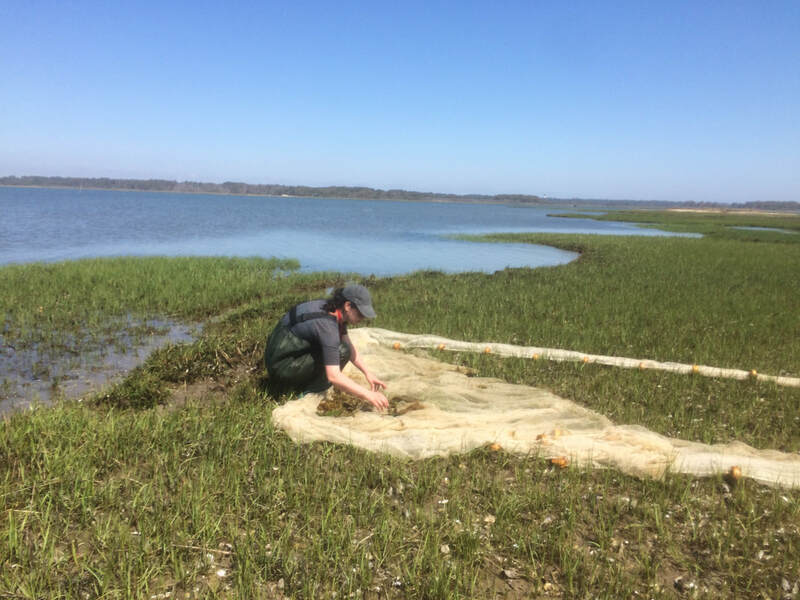 We are very excited to welcome Dr. Arne Jacobs, our new postdoc who is joining us to investigate the genomic and regulatory mechanisms underlying local adaptation in silversides. 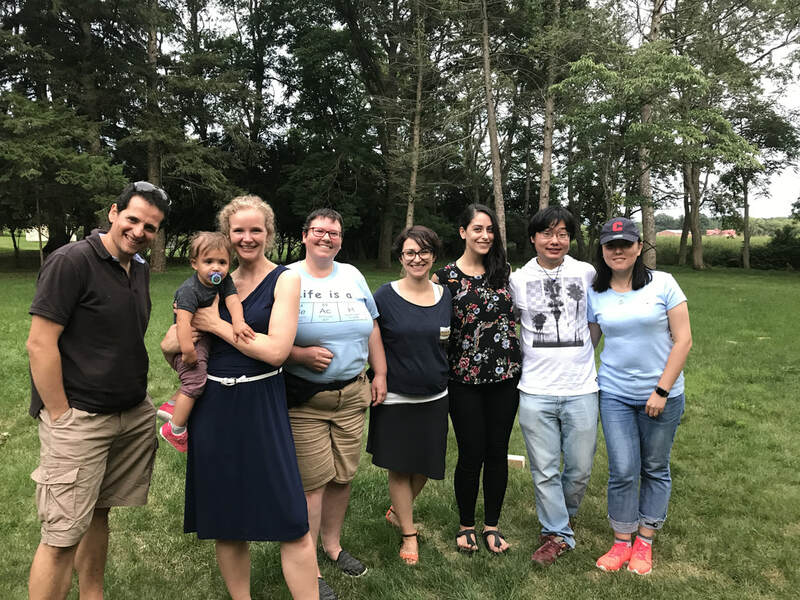 The Therkildsen lab hosts SNEEB – the weekly social hour for grad students, post-docs, and faculty from various departments including Ecology and Evolutionary Biology, Entomology, and Neurobiology and Behavior. 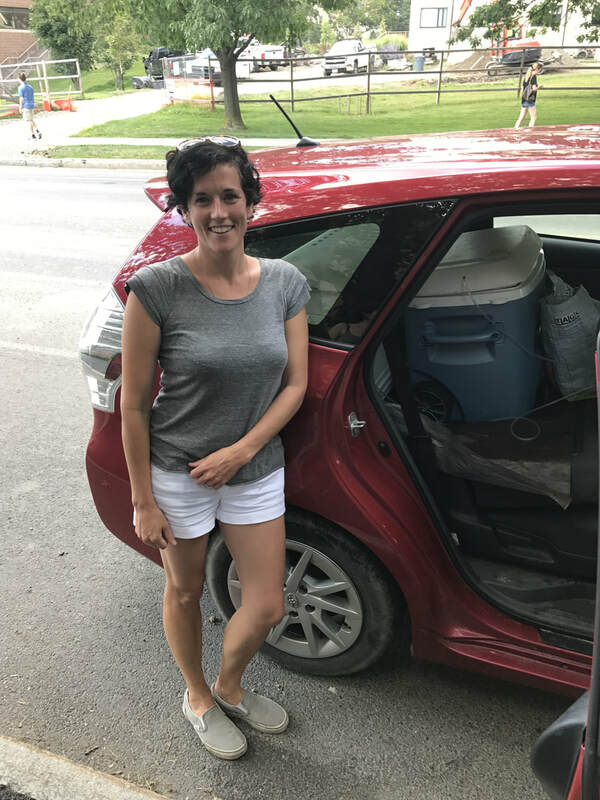 Maria presented a poster at the RECOMB Comparative Genomics Satellite Conference (RECOMB-CG) in Sherbrooke, Quebec with travel support from the Center for Vertebrate Genomics at Cornell. Former postdoc Dr. Anna Tigano has moved to New Hampshire for a postdoc in the MacManes lab. Congratulations Anna! We will miss you! We're excited to welcome Chrissy Rochus, a postdoc from Leif Andersson’s lab at Uppsala University, who will be visiting us for three months. 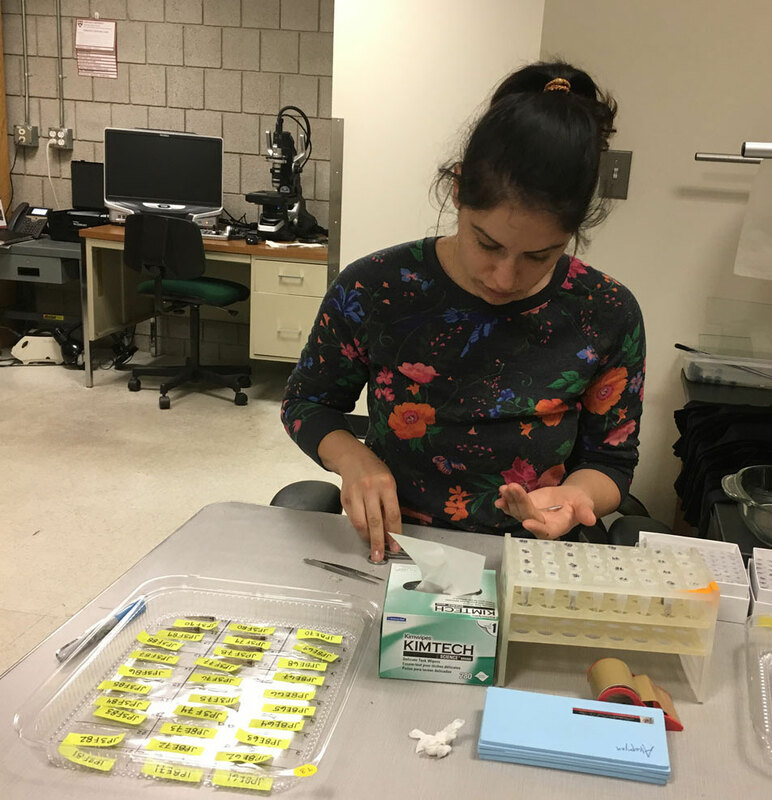 Chrissy is studying the patterns of genetic change in Baltic herring over the past century. 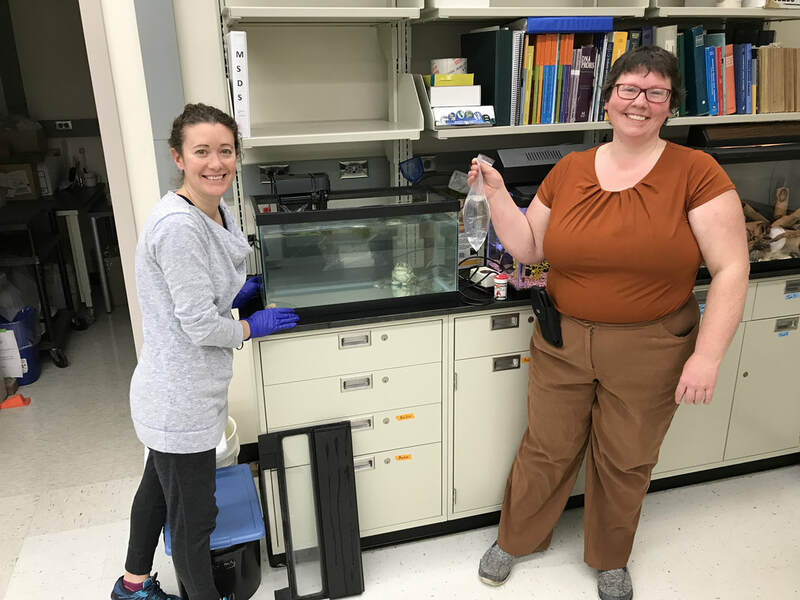 During her visit, she will be extracting DNA and preparing libraries from historical Baltic herring scales in our ancient DNA lab. Glass slides with herring scales from 1923. All scales were scraped off with a razor for DNA. Anna and Nina presented at the Unveil Symposium on the Evolutionary Genomics of Adaptation at the Flathead BIological Station in Montana. 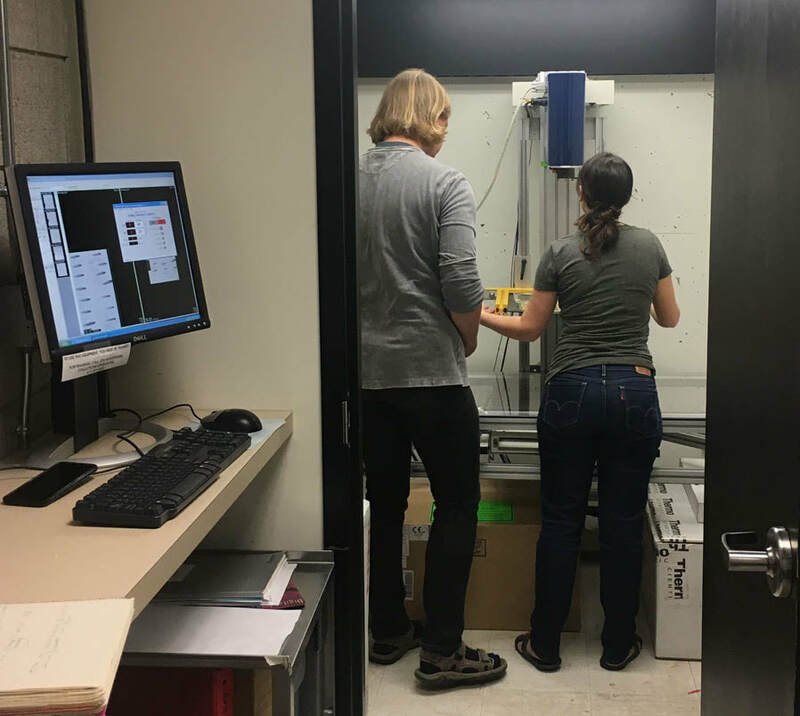 Nicolas and Nina presented at Cornell's Center for Vertebrate Genomics Symposium. Nicolas presented at the Joint Meeting of Ichthyologists and Herpetologists in Rochester, New York. Nina recently visited the University of New Hampshire, first attending a great Sea Grant Symposium that synthesized current knowledge about the population structure of Atlantic cod in New England waters, integrating views from scientists with on-the-water observations from fishermen. 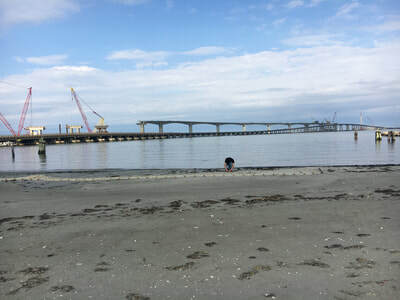 Following this, Nina participated in the first two-day meeting of the NOAA/NESFC-sponsored working group tasked with evaluation whether current management units are consistent with the current best available information about cod stock structure. Hannes and Maria traveled to Boston’s Harvard University to meet with Valentina di Santo from the Lauder Lab at the Museum for Comparative Zoology. Thanks to our collaborators there, we were able to use a 2D-digital X-ray machine to produce x-ray images of the silversides in our QTL mapping study. 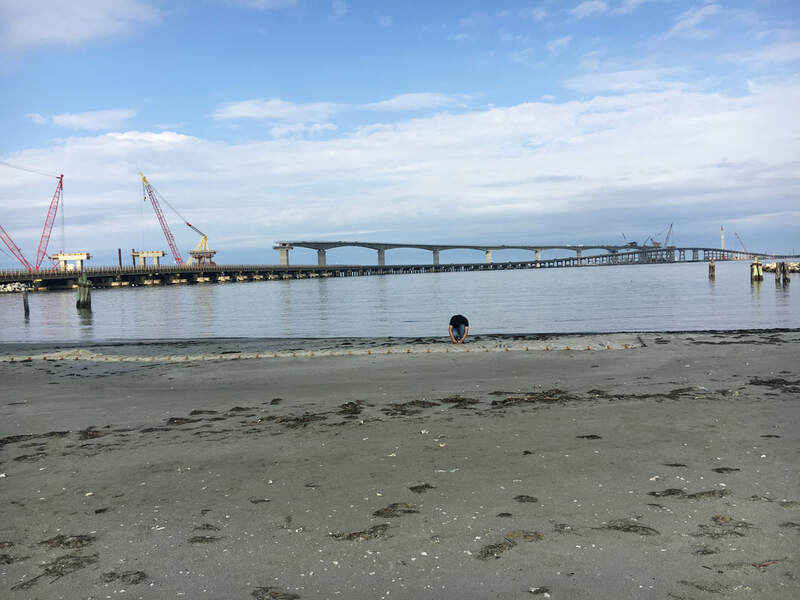 These images will allow us to count the vertebrae, which increases in wild populations from south to north. 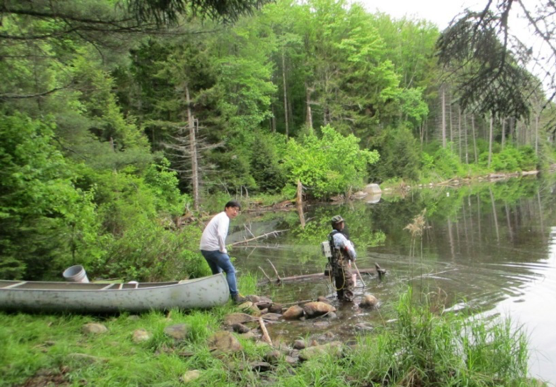 Nicolas joined Doug Carlson and Stephanie Weston, our collaborators from the NYDEC, on their sampling trip to the Adirondacks. 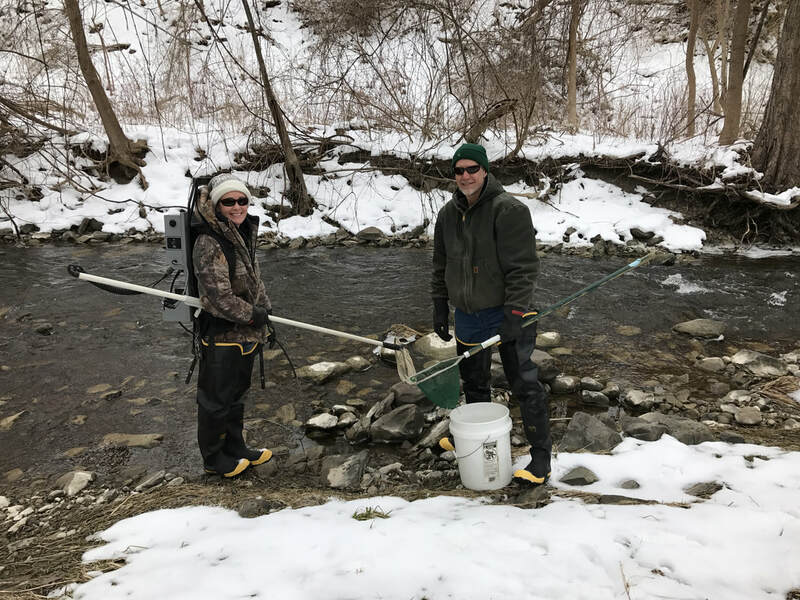 The team is collecting fish for a genome-wide comparison of intra-specific variation, with the aim of characterizing how distinct the summer sucker (the only fish species endemic to the New York state) is genetically from the much more widely distributed white sucker (Photo credit: Doug Carlson). 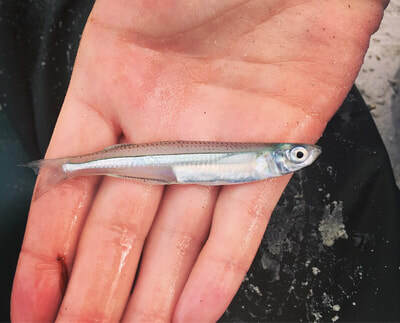 To build linkage maps for the Atlantic silverside and map key fitness traits to the genome, we had established several inter-population crosses between fish collected in Georgia and New York. 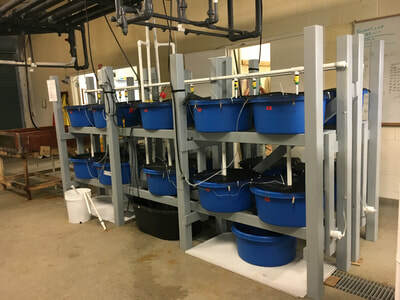 The photo shows pure-bred F1 individuals raised under common conditions in the lab with parents from the two populations (top three fish have New York parents, the bottom three fish have parents from Georgia), illustrating the stark difference in growth rates. 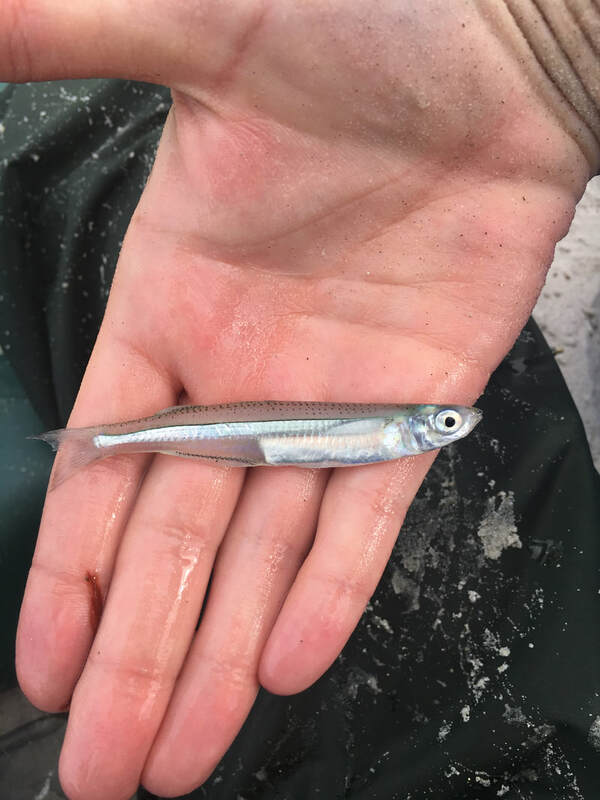 The inter-crossed F1 individuals have now matured, and our collaborator Hannes Baumann along with Maria and his team, successfully got them to spawn to form several large F2 families that we can use for mapping. Most of the lab attended EvoDay 2018, a full-day symposium on the topic of local adaptation at Cornell’s Lab of Ornithology. Nina presented new results from our silverside work in a talk titled “Chromosome-wide footprints of selection underlying local adaptation with gene flow”. 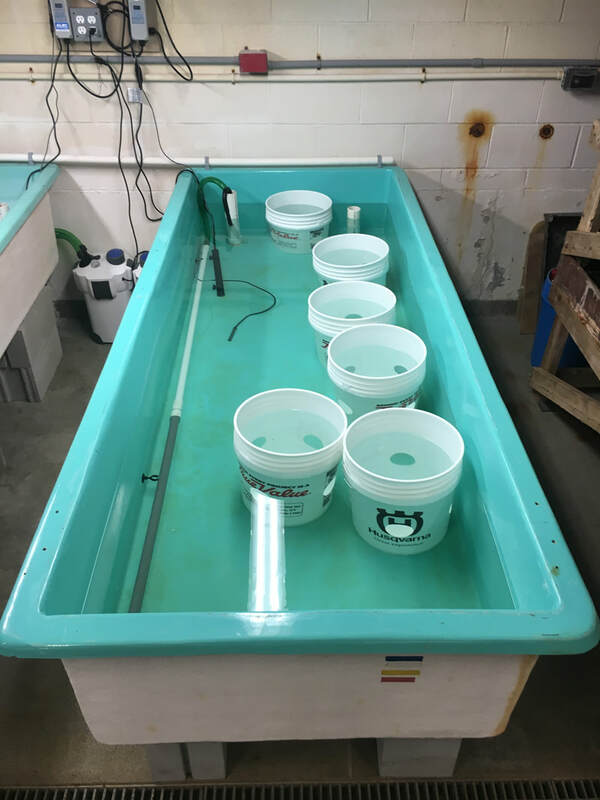 Nicolas and Maria traveled to North Carolina and Virginia to sample silversides for our study examining selection dynamics over seasonal time scales. 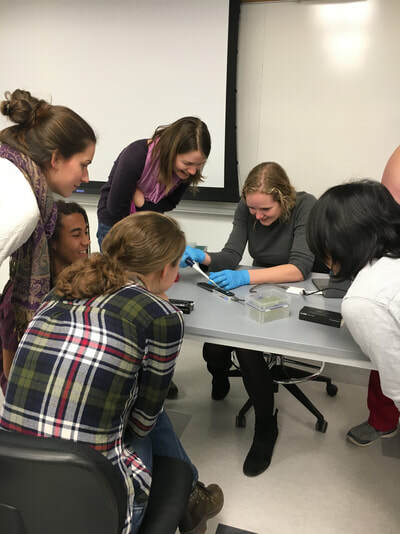 The Therkildsen Lab does real-time sequencing on a tiny, portable Nanopore MinION sequencer! 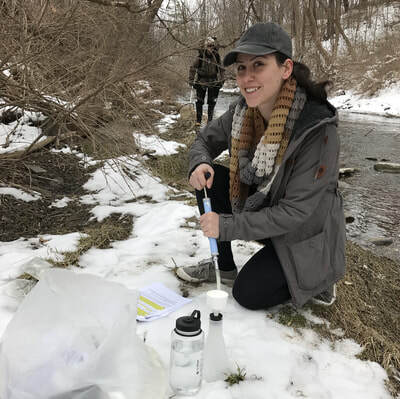 We are using the sequencer for an eDNA project as part of our class NTRES 3400 (Molecular Tools for Ecology, Conservation, and Natural Resource Management) taught by Nina. Eileen Randall and Kurt Jika from Cliff Kraft's Lab helped us with field sampling at two of our sampling sites so we could compare the fish species composition inferred with metabarcoding and electrofishing. 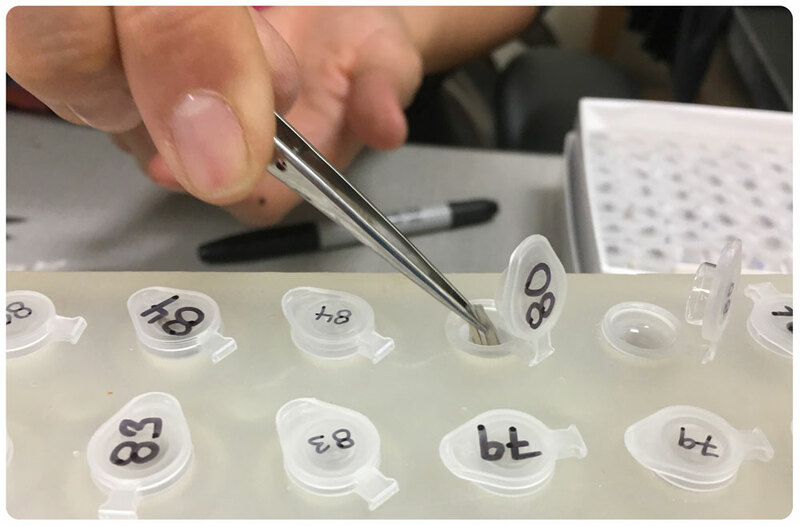 ​Later in the summer, we will use the MinION sequencer to generate long reads for our silverside genome assembly. NSF has funded our silverside grant! 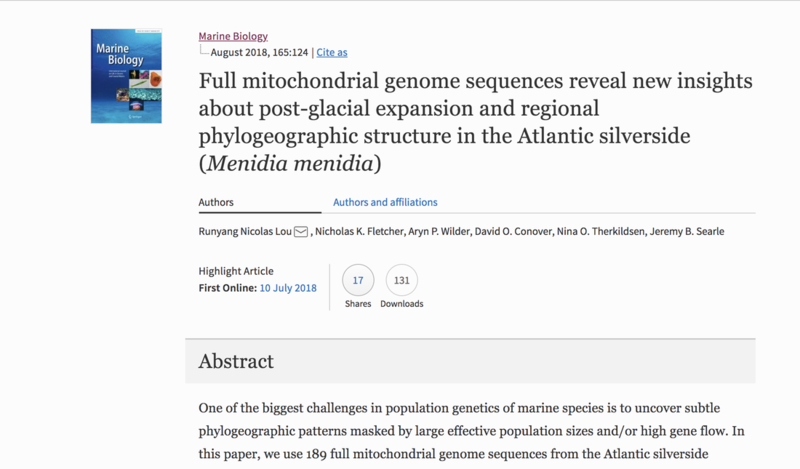 We are overjoyed to announce that NSF is funding a collaborative research project to look at the genomic underpinning of local adaptation in the Atlantic silverside! Check out the project website designed by our collaborator Hannes Baumann to learn more. 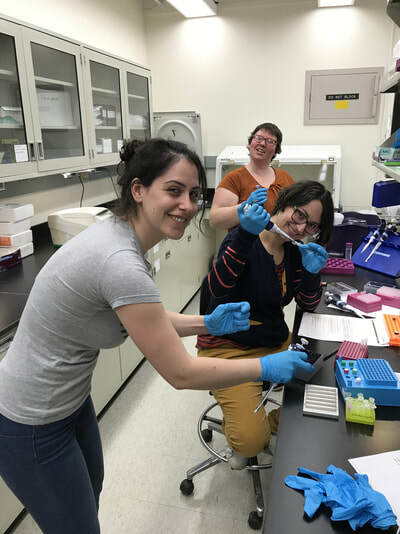 Our ancient DNA lab is up and running! 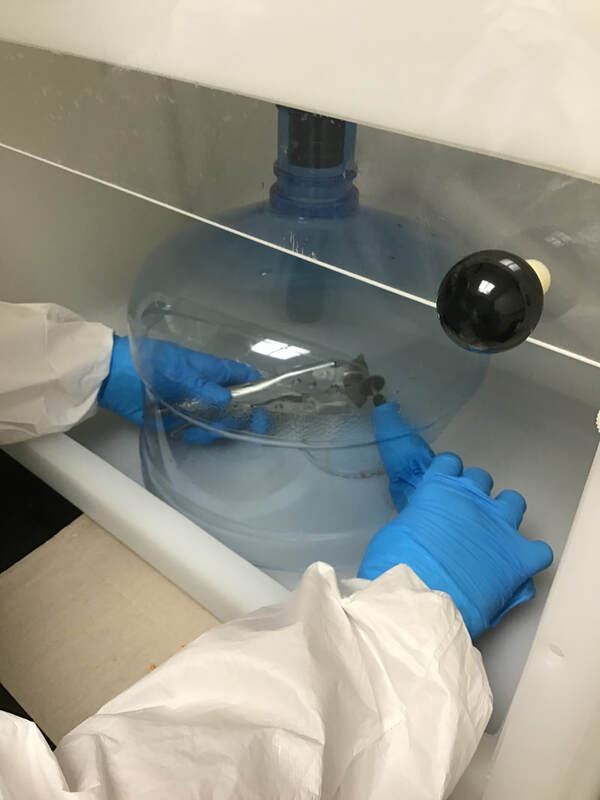 We have now finished setting up our second laboratory, which is exclusively dedicated to pre-PCR work with ancient and historical samples. The room has UV irradiation at night, positive air pressure with all incoming air passing through a HEPA filter, and restricted access in protective clothing - all to minimize the risk of contamination. 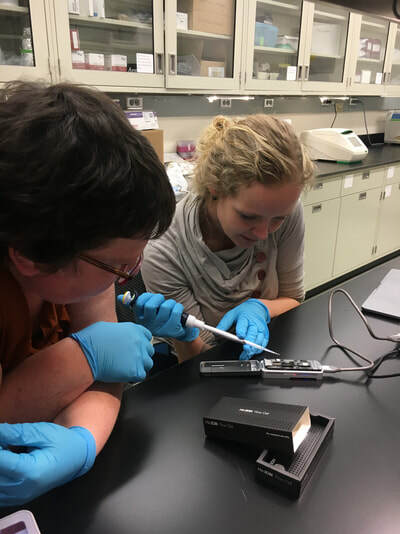 We are excited to start recovering DNA from cod bones excavated from archaeological sites and work with other ancient samples in the future. 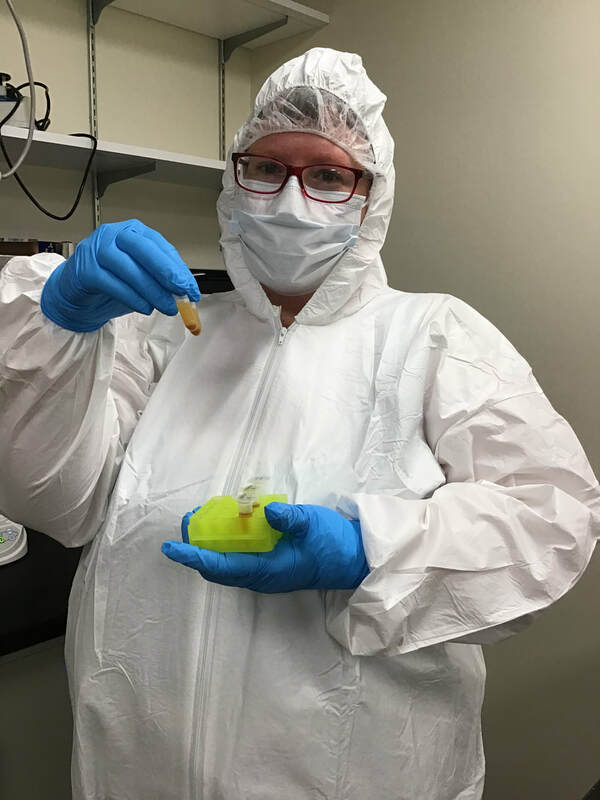 Former postdoc Dr. Aryn Wilder has moved to California to start her new job as a conservation genetics researcher at the San Diego Zoo. Congratulations Aryn! We will miss you! We're thrilled to announce that the Therkildsen lab, in collaboration with Dr. Philipp Messer, has received seed funding from the Center for Vertebrae Genomics (CVG) at Cornell University for our research using historical DNA samples to characterize the genomic basis for fisheries-induced evolution in Atlantic cod. Maria has also been awarded a CVG Scholars Program Award in support of her work on the cytogenomics of local adaptation in the Atlantic silverside. Congratulations to Maria!